Preflop Master - Unexploitable Strategy! Playing perfect ranges and adjusting it to different opponents is the best way to go! Do you want to open correct hands? Do you want to know how to play vs 3-bets? Do you want to know how to play from blinds? Do you want to know how to change your strategy vs different opponents? How to play facing different sizings? What hands to float and much more! In short, this is a complete course that will cover you play in every possible situation preflop. You will know how to categorize players and change your approach based on that. Moreover, you will learn GTO strategy which you can implement in any limit and no one will be able to win money from you. So you will have no more questions what you should do, should you 3-bet light a lot or you shouldn’t. All your questions will be answered and you will play with certainly from now. Don’t wait, take this course right now and start winning! It will be the best decision that you could make today! Is it GTO or exploitative play ranges? We will start with GTO ranges and adjust it to exploit players depending on their play. So you will have both GTO and exploitative ranges. Where I can use these ranges? It is preflop ranges for basically every spot. You will know who to play when you are opening and how to play when you face an open from different positions, vs different opponents and sizings, so you will have complete strategy. What stakes I can use it on? You can use it on any stake! GTO approach is same everywhere and you can stick to it no matter how high or low you play. When you play lower stakes you can play more exploitative strategy that I will provide because you will face more weak opponents and when you move up higher and higher GTO will be your friend! It was the first thing that started changing my game. Understanding GTO approach and how to change that vs different opponents made my life very easy preflop and I never looked back! I had different charts and strategies before, but nothing comes close! 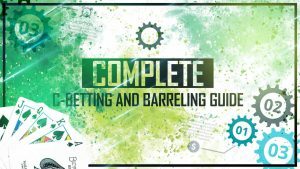 This is a perfect guide that lets you understand strategy and implement it in your game, take it while you can! If you have any questions how you should play preflop this will answer it! It was much better than I expected and I highly recommend it! I never thought playing could be so easy. Fixing preflop leaks is the first step to improving your game and move up stakes. It never been easier than now with this flawless strategy!